While communities nationwide search for new tools to address urban sprawl, rural development and the loss of riding land, one small town in Wisconsin seems to have hit upon an answer. With hard work, determination and persistence, the Caledonia Conservancy in Racine County, Wisconsin is making significant progress in conserving, protecting and educating the community about equine land use and natural environments. In 2012 the Equine Land Conservation Resource bestowed the Anson W. Taylor, Jr. Award for Equine Land Conservation upon Caledonia Conservancy. The award, established by ELCR in 1999, recognizes an individual or organization for outstanding leadership in land conservation and land access for equine use. The Conservancy was recognized for the organization’s strength in equine land and trail conservation, understanding of and activity in shared-use recreational trails, positive organizational development and recent accreditation from the Land Trust Accreditation Alliance. While horse trails remain a major focus, the organization was also recognized for successfully expanding its membership and support beyond the horse community with a broad level of conservation interests that include land, trails, stewardship, environmental education and significant youth involvement. 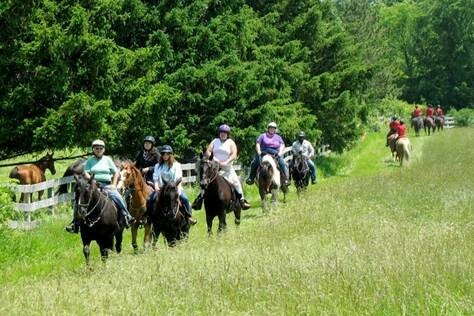 The Caledonia Trails Conservation League, Ltd. was formed in 1994 to help protect open space and trails for horseback riding. Its original function was to host a holiday foxhunt to thank local landowners for use of their land. It was incorporated in 1995 and received its 501(c) 3 tax status in 1996 as the Caledonia Conservancy. A three-year effort earned the Conservancy its accreditation via the Land Trust Accreditation Commission in 2012, one of only two all-volunteer land trusts to achieve this. Caledonia Conservancy provides an excellent model for those considering the establishment of a land trust. Wendy McCalvy, the Conservancy’s first president, advises that the analysis and goal-setting necessary to establish a land trust is worth the effort and expense in the long-run. Organizers of new trusts should be prepared for a steep learning curve that includes methods to protect land, tax deduction strategies, fund raising expertise, computer skills for data bases, plan making, writing and speaking skills. “Sometimes, in an effort to act with haste, what gets lost is planning. Eventually, this can become debilitating. ” – Wendy McCalvy, first president of the Caledonia Conservancy. Early in the process, several committees were formed, including rail management and maintenance; park acquisition; financial and insurance; auction; and, grants and fundraising. One member regularly attended local government meetings to keep the Conservancy apprised of planning and development – often providing a ‘first alert’ of impending land loss. Photo courtesy of Caledonia Conservancy. In spite of hiring a national land trust consultant to assist in forming a strategic plan, the group lost several members in 1999 because there was just too much to be done. But they persevered, and the group separated into 18 committees of at least two members to try again. Everyone was on at least two committees and head of one. “This way, nothing gets lost and it’s easier to meet,” explains Wendy McCalvy. Today the trust works through six committees: stewardship, school to nature, outreach, finance, preservation and governance. Its new president, Eric Roberson, has revitalized the all volunteer organization’s desire to keep going. At the same time Roberson wants to step back, take stock of current and potential land acquisitions and determine the best way to use and maintain them in perpetuity. The Conservancy purchased its first land parcels in 1995 with a contribution of $250 each from the six founding members. One of these parcels, 4.5 acres of unbuildable floodplain along the Root River once used to raise minnows, became Trout Ponds, now the cornerstone of a riding preserve. Two years later 23 acres of floodplain adjacent to the Trout Ponds were added. In 2003 the Conservancy permanently protected 11.5 acres of old-growth woods in the Tabor Woods Natural Area. 13.8 acres were added in 2006, with another 24 acres in 2009. In that year it also placed a 26-acre conservation easement on the property of Larry and Wendy (the Conservancy’s first president) McCalvy. Currently, Racine County and the Village of Caledonia have approved a plan to donate 14.87 acres of woods and wetlands to the Conservancy. The trust pursued grant funds to acquire 38 acres in an environmental corridor with an old horse trail and an endangered species. The town agreed to take possession of the property as a park with a horse trail — a win/win situation for the town, because the Conservancy was able to purchase the land when the town did not have the funds. A key reason for founding the Conservancy was to control development. Acquisition of the above acreage originated from an effort to stop the rezoning of a Christmas tree farm into quarter-acre lots. The land trust board was concerned that the park project would siphon funds from acquisition of horse trails. However, it agreed that the expenditure was justified by the benefits of a slowdown of development, positive liaison with the town, county and neighborhood, expansion of a possible fund raising base and the first sanctioned horse trail on a town park. A few large donors have underwritten efforts to purchase available land quickly. In addition are many small donations and contributions of labor and time. Contributors are urged to check with their employers to see if matching funds are possible. Dinners, tee shirt sales and a variety of attractive signs to mark trails are made and marketed. The Conservancy would prefer to acquire land through less expensive and more conventional methods like conservation easements and acquisition of development rights. But, Conservancy board members know the trust can accomplish much more if it develops significant, organized programs that will attract larger financial gifts. The Conservancy is currently working on the establishment of two permanent funds – the Terrafirma Defense Fund and another fund as a permanent endowment. In addition to the defense fund, the Conservancy plans to have an endowment to be held by the Racine Community Foundation. The earnings of the fund would be available for Conservancy operating expense or land purchase. A great deal of the Conservancy’s success stems from the fact that this is not just a land trust. It is an organization for and about people and their enjoyment of the land. New neighbors are warmly welcomed; photographs abound of members aiding each other after storms damage property; local farms host round robin rides. The conservancy has placed a great deal of emphasis on educating the community, especially youth, on the environmental value of the land and habitat held by the Conservancy. Rules for riding the trails are posted and conform to Milwaukee County ordinances that protect the public’s health, safety and welfare, as well as protect soil from erosion, water quality and habitat from degradation. pursuant to Milwaukee County General Ordinance 47.12. (1) Ride on designated paths only. (2) Refrain from riding on pavement. (3) Riding is permitted during daylight hours. (4) Unruly horses barred. Horses must be easily turned and stopped. (6) Riders will yield the right of way to Pedestrian. Whenever groups of people are visible horses shall be ridden at slow gaits. (7) Riders shall comply with all Department of Parks, Recreation and Culture rules and signs along the paths. The most significant accomplishment of the Conservancy may be the concept of Conservation Subdivisions to Racine County – an unconventional planning mechanism. Caledonia adopted a conservation subdivision ordinance (http://www.ncwrpc.org/wapa/Susan_Greenfield.pdf) to preserve open space and to facilitate an expanded range of housing choices. The most desirable parts of the land are set aside and houses clustered on smaller lots on the remainder. Conservation subdivisions are required for all land divisions of a parent parcel of three acres or larger creating five or more lots. The ordinance requires 40 percent of the site area in a conservation subdivision, located in an urban area with access to municipal water and sewer, to be preserved as open space. In rural areas with onsite sewer, 60 percent of site area must be preserved as open space. Caledonia requires the developer to submit a land Stewardship Plan for the open space (conserved lands) in a conservation subdivision. The open space is owned and used communally by residents. By extension, equestrian trails can be established in these communal areas. The first two such developments are planned in Caledonia. An additional fifteen acre “Keland” parcel has been purchased. Other areas are considering partnering with the Conservancy and opening their land to the community. Click here to see the Caledonia Neighborhood Land Use Plan, describing conservation neighborhoods. For more information, visit the Caledonia Conservancy: www.caledoniaconservancy.org, or visit Caledonia Conservancy on Facebook.